Here is the full article titled Savoy Ballroom Spends $109,000 to Capture the ‘New Look’ from The New York Age on 3rd June 1948. “Last fall the Savoy – “House of Happy Feet” spent $109,000 to obtain that stylish “new look” in ballroom fashion so fascinating to the most discriminating interior decorator. When one compares the Savoy of 1948 with the internationally famous dance hall of a scant seven months ago it’s almost impossible to remember what the Savoy of yesteryears looks like. Although the Savoy has been redecorated five times since its opening in 1926 its present renovation surpasses all previous ventures. The once drab and inconspicuous exterior of the ballroom now features huge glass doors on the main floor costing $3,000. Keeping harmonious pace with the building’s front is the ultra-modernistic interior. The checkroom located in the basement, which formerly had accommodations for 5,000 coats, hats, and other wearing apparel, has been enlarged and a television set has been installed. The dance hall itself has been transformed into a breathtaking and picturesque scene of color and splendor. There are stainless steel columns supporting the new ceiling, indirect lighting, 1500 yards of magnificent plush carpeting of gold, brown, and red designs which cost nearly $18,000. The artistry of the ceilings is a fascinating sight. Gold tapestries and glass fibre cloth of gold hang in rippling waves of color. The walls are handworked with chartreuse leather inset with numerous miniature mirrors, which cost $12,000. The carpentry work clicked the cash register at $28,000. The boxes encircling the dancefloor, and the bandstand have been made more spacious. “The Home of Happy Feet,” a descriptive term coined by the glamorous cinema star, Lana Turner, has welcomed nearly 30,000,000 feet into its portals in the last 22 years. The Savoy with its block long waxed floor, checks in 1500 customers nightly, who dance the fox trot, lindy hop, rhumba, two step and the innumerable variations of steps to the music of two name bands featured nightly. The world famous Lindy Hop reputed to be the only national American dance, was given birth on the Savoy’s dancefloor, as a tribute to Col. Charles H. Lindbergh, following his solo flight from the United States to Paris. During the last war American servicemen of all races and creeds taught the Lindy to inhabitants of practically every country on the universe. Prior to World War II, 35 percent of the Savoy’s clientele was white, today it is around 15 percent. When Charles Buchanan and Moe Gale of the Gale Agency entered into partnership with the former as manager of the Savoy, 22 years ago, the building was purchased for $75,000. Today it is valued at more than $750,00. The yearly operation cost is around $500,000 with an intake of a million dollars. Buchanan, the 49-year-old manager, averages $35,000 in salary from the Savoy. He also is vice-president of the Gale Agency, a downtown theatrical and booking agency. Mr Buchanan’s business training came from working as a real estate operator, stock salesman and commercial photographer. 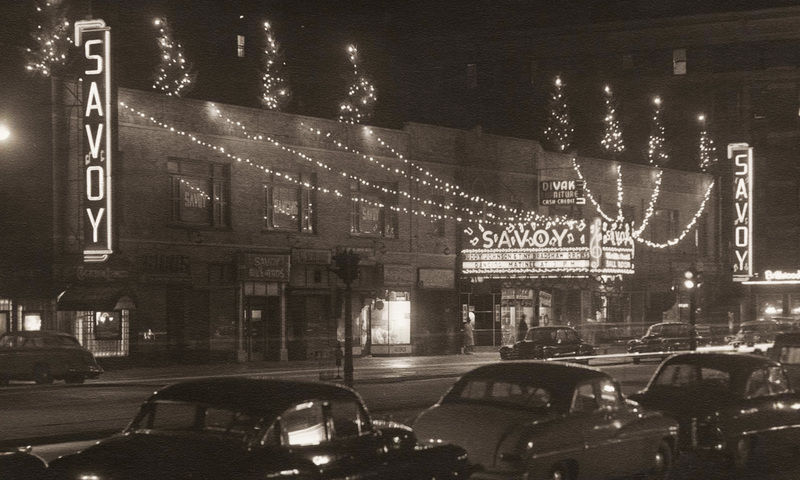 The Savoy, operating on a seven-night a week schedule, features a different attraction each evening, a night for women, lindy hoppers, adults, community and social groups, sponsoring invitational or paid affairs. On three occasions the police estimate that over 100,000 persons vainly attempted to gain admittance to the Savoy. They were the party for the late Florence Mills, the competition between the late Chick Webb and Benny Goodman’s orchestras, and reception for Joe lewis in 1935 when he defeated Primo Carnera. Among the top name bands which have reached the pinnacle of success through appearances at the Savoy are Duke Ellington, Cab Calloway, Lucky Millinder, Erskine Hawkins, Don Redman, Cootie Williams, Luis Russell and others. It is reported that practically every nationally known orchestra has played to audiences at the Savoy at one time or another. Among them being Guy Lombardo, Harry James, Charlie Barnet, Tony Pastor, the late Glenn Miller, Xavier Cugat, Count Basie, Lionel Hampton, Earl Hines, the late Jimmie Lunceford, Woody Herman, Tommy and Jimmie Dorsey, Artie Shaw. Over 150 employees – cashiers, doormen, check room attendants, waiters, musicians, porters, advertising men, promotional personnel, office help and floor men are needed to maintain the Savoy.